Could we be embarking on a new era of industrial revolution? This time based around sustainability? Given that 20% of global freshwater is used for industry and energy production, there is certainly a case for business and industry to move in this direction and it seems that many are taking up the mantle. Businesses rely on good quality freshwater for direct operations and supply chains. We learnt about embedded water in our earlier blog Eighty litres of water in an orange and that it takes a whopping 11,000 litres of water to produce one pair of jeans. In a later blog (so stay tuned) we will hear about water scarcity and, with the balance of supply and demand so precarious, governments are beginning to intervene. Regulations imposed by governments, including water usage restrictions are becoming more common. It was recently reported in the New York Times that the Californian government has imposed its first mandatory water restrictions to deal with drought – enforcing a yearly 25% reduction on the 400 local water supply agencies which serve 90% of the Californian population. The Guardian reported that Californian restaurants are being required to ask diners if they want water before serving them automatically. Hotels are offering guests the option of not having their sheets and towels washed daily. Whilst restrictions in California are promoting the issue of sustainability, some businesses are taking a proactive approach. The HSBC Water Programme is collaboration between HSBC, Earthwatch, Water Aid and WWF. 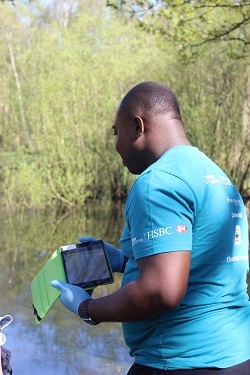 Our target is that 7500 HSBC employees will have been trained as Citizen Science Leaders by 2016. These leaders are embedding sustainability into their everyday business practices. They understand that a freshwater sustainability plan is critical for employee engagement, and creating financial savings (reduced energy costs and water bills) - all ultimately impacting profit and growth. According to a sustainability business toolkit article, a study by MIT (Massachusetts Institute of Technology) in 2011 showed that sustainability in the US plays a permanent part in 70% of corporate agendas. More recently The Guardian reported that UN secretary general Ban Ki-moon has declared 2015 “the year of sustainability”. So don’t delay, embrace this new industrial revolution towards sustainability! For details on how to partner with Earthwatch to embed sustainability into your organisation, click here.